Perfect for conference room drops and more! This Gourmet Treats Custom Gift Lunch Cooler is filled with a variety of sweet and savory snacks. Give your promotional efforts a healthy boost with this Orange promotional stress ball in the shape of an orange. 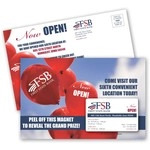 Mail this Full Color Postcard w/ Custom Business Card Magnet to clients to grow your brand company! Completely design this mailer to fit your branding needs. Promote your biotechnology company with promotional products from ePromos! Beat the pharmaceutical competition with imprinted pill boxes to distribute throughout medical offices. Win over doctors with promotional food items, such as imprinted cookies & chocolate. Get your name out in the biotech world with promotional body-part stressballs, promotional live plants, and more!